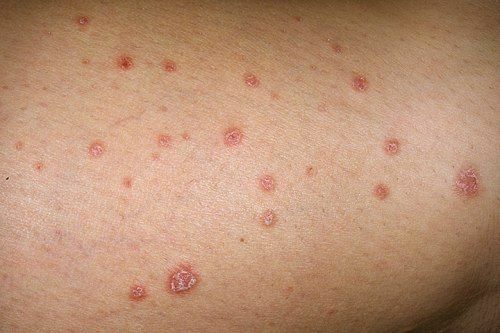 Psoriasis is an autoimmune disorder that affects roughly, 7.5 million Americans and is characterized by dry, itchy patches or plaques on the skin where skin cells have built up. While there is no known cause or cure for the disease, there have been several factors or triggers linked to outbreaks or worsening of flares. Over the last decade or so, you may have noticed a trending diet known as, going gluten free. This isn’t some fad way of eating for most. People that eliminate gluten from their diets are typically gluten intolerant and are suffering from celiac disease. Gluten is a protein found in wheat, barley and rye. While there is no definitive research from the medical community supporting that going gluten free will help psoriasis, there has been several reported cases of it doing so. It may benefit you to try going gluten free for a few months and document what, if any changes you have noticed with your flare-ups and symptoms. High-fat dairy products have been attributed as contributing to inflammation, so it would make sense that by cutting high inflammatory foods from your diet, it may help to reduce psoriasis symptoms. Psoriasis is after all, a disease of inflammation. If eliminating dairy completely is not something you are committed to doing, try replacing high fat dairy products such as whole milk with lower fat alternatives. Feast on lower fat cheeses and yogurts packed with probiotics and live cultures. There has not been a link determined between consuming fatty, red meats and psoriasis. However, overindulgence in red meats has been linked to cardiovascular (heart) disease and patient’s who suffer from psoriasis are at a higher risk of developing heart conditions. Limit your red meat intake and replace them with leaner cuts, chicken breast and fish. Fatty fishes are packed with omega-3 acids that have been reported to reduce inflammation. Fatty fishes include: albacore tuna, mackerel, lake trout, herring and salmon and should be consumed at least twice a week. If you are not a seafood person, talk to your doctor about substituting an omega-3 fish oil supplement in place of fatty fish dietary recommendations. The idea behind the raw food diet is that is packed with raw fruits and vegetables. It would make sense that this diet would help alleviate psoriasis symptoms because many fruits and veggies contain a skin healthy vitamin, otherwise known as vitamin A. Good choices for vitamin A consumption are: cantaloupe, watermelon, tomatoes, mango and carrots. Leafy greens are another skin and heart friendly food with this diet. Leafy greens tend to be packed with iron, calcium, magnesium and potassium. They also have vitamins C,E, K and B. A diet filled with leafy greens is essential for heart healthy options and again makes this a diet beneficial to psoriasis sufferers. While there is no definitive diet for psoriasis patients to follow to ensure complete treatment and prevention, these food choices and dietary restrictions are worth implementing to see if you are one of many, who claim to have experienced improvement of their condition by adhering to them.